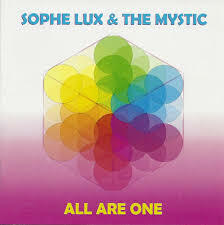 Popdose Exclusive Album Premiere: Sophe Lux & the Mystic, "All Are One"
All Are One presents a universe of visionary art-rock narratives bathed in glittery psychedelic and operatic textures. The album offers lush soundscapes of interwoven angelic choruses and soulful R&B vocal leads riding electronic keyboards that evoke both 80’s electro-pop and vintage; they sound both nostalgic and futuristic. Poetic dream worlds and alternate realities converge as Haynes’ mystic theater-of-the future unfolds. She shows herself to be a dramatic story-teller and shape-shifter who is fully possessed by the characters that populate her songs: an alien child from the future who sends a comet of love and awakening to earth (“The Love Comet”), a voodoo high priestess performing a soul retrieval (“Your Wonderland”), and a robot shaman priest preaching a new humanism (“All Are One”).